It seemed every time teacher Jeff Calhoun turned around, 16-year-old Alexis Loera had wandered away on recent spring field trip. One time Calhoun stopped to address the group of about a dozen and Alexis kept on walking down the trail. Alexis was always the last to the car when it was time to leave. For Calhoun, a teacher of wildlife ecology and biology classes at Dodge City High School, those minutes spent waiting were greatly appreciated. Up until he moved to Dodge City two years ago, Alexis’ life was far different. Not only was Alexis bird watching with Calhoun and other KOS members, he was taking some impressive photographs, thanks to his teacher. It helped that Alexis was accessing some nice places. As a state, Kansas has been ranked third in the nation for bird diversity by the National Audubon Society. Habitats include towering oak and hickory forests, more than a half-dozen types of prairies and several truly world-class wetlands. To date more than 450 species of birds have been documented in Kansas. Some who came to the KOS event recorded over 180 different species as they come and went from Dodge City for the three-day event. Alexis and others with Calhoun found more than 100 different species in about eight hours of looking around in Ford County. The birds ranged from thumb-sized migrating warblers and tiny burrowing owls to many kinds of much larger waterfowl and birds of prey. Alexis didn’t get them all captured with the borrowed camera, but he recorded dozens of species with some pretty impressive images. That includes magpies in flight, singing wrens and some cool shots of a whimbrel and it’s awesome long and curved beak. There’s no question a new passion has been created for the big city California kid now loving the Kansas outdoors. 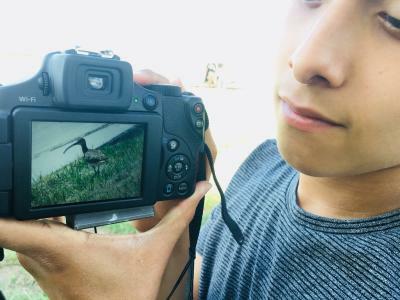 In Kansas Alexis will have plenty of opportunity to hone his bird photography skills. 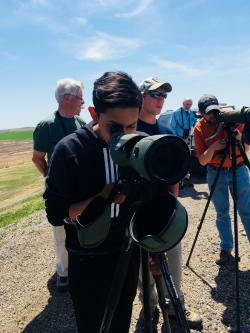 Calhoun, his teacher, is one of the most accomplished birders in Kansas and leads many field trips. As well as KOS, the state has several groups willing to help others learn more about birding.